Earlier this month, we celebrated the 70th birthday of Pam and Ben, CPA’s beloved co-founders and movement leaders. It was beautiful to see so many generations of comrades, activists, friends and loved ones gather in one room to celebrate the love and legacy of this amazing movement couple. Many of us, including myself, have been mentored and nurtured by Pam and Ben over the years. Many of us have shared meals with Pam and Ben, often in their home! Many of have come to think of Pam and Ben as our Auntie and Uncle. This is important both personally and politically. As I’ve written before, nurturing the next generation is not just a good or nice thing to do; it is a political project that is integral to our future. At Pam & Ben’s birthday, I was able to see how the seeds and care that Pam and Ben have planted over the years have nourished the growth of many individuals and partnerships and communities. It encourages me to keep thinking about the long arch and to keep experimenting with bigger and bolder organizing in one struggle, on many fronts. Applications for all of our youth programs are open. Apply today or forward to someone who might be interested at www.cpasf.org/youthapps. We are hiring for TWO new positions — Apply today and forward to someone who may be a good fit! Save the Date for our annual summer picnic! Join us to eat delicious food, play games, and be in community. Adventures in Big Organizing: CPA Goes to LA for Grassroots Solidarity and Workers Organizing Exchange! In this political moment, one of the pivots we are making is experimenting with big organizing. In Rules for Revolutionaries: How Big Organizing Can Change Everything, Becky Bond describes big organizing as using scalable strategies to mobilize hundreds, thousands, and millions of people at a time to build mass movements. 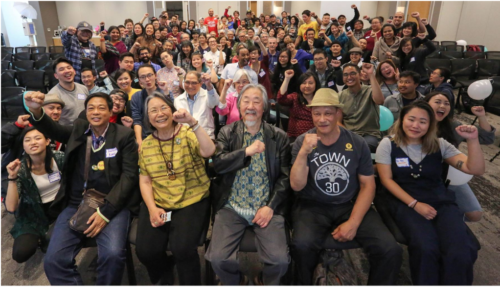 CPA organizing staff and members took a trip down to Los Angeles to learn about big organizing by meeting with workers from Pilipino Workers Center (PWC), Chinatown Community for Equitable Development (CCED), and Koreatown Immigrant Worker Alliance (KIWA). For two days, our members were able to learn about other worker organizing campaigns, connect their shared struggles, and also learn some multilingual chants and songs! We learned about the struggles of Filipino domestic workers, LA Chinatown seniors fighting rent hikes, and Latinx food service workers. Our members were moved by a story of a PWC leader who had experienced labor trafficking and came to PWC for assistance. She became a leader in her workplace and started organizing other domestic workers as part of PWC exciting worker circles model (Right: Image of members and staff of CPA and PWC). In turn, our CPA member and former Yank Sing worker leader Pei Fang shared her stories of how she got involved in the campaign. “At first I was afraid to join the campaign because of fear of retaliation. But then I realized my power as a worker and I began talking to more and more of my coworkers.” She answered questions and shared advice with workers who are currently in a campaign to organize coworkers. For almost 30 years, Arab Resource Organizing Center (AROC) has been on the forefront of social justice movement in San Francisco, playing an integral role in supporting Arab and Muslim youth in multiple middle and high schools in San Francisco. Just this year, AROC supported the creation of the very first Arabic Language Pathway at Mission High in San Francisco Unified School District (SFUSD). However, for the last three years, SFUSD has prevented AROC from working in schools due to pressure from racist organizations, even despite a positive assessment of their work by and overwhelming support from the community (Image Left: MOJOers holding signs that say “I Support Arab Youth”). On May 8, MOJOers turned out to the SFUSD Board of Education meeting to stand up and #SupportSFArabYouth. “In this political climate right now, we know that there’s an environment of Islamophobia and we know that our schools are not immune to that…In this political climate, it’s incredibly important for elected officials to have bravery and to take action; otherwise, we are letting down the communities that need us and that need services like AROC. We’re here to stand together with them on this.” See Nevin’s testimony here. We’re so excited to share that just last week, the SF Board of Education voted 6-1 in favor of renewing its agreement to continue allowing AROC to serve SFUSD schools — a huge movement victory for us all! May Day 2018: Sanctuary for All! In this political moment, workers, immigrants, women, and communities of color are facing attacks on all fronts, from Trump’s plans to broadly cut social services for low-income families, breaking apart of families through ICE raids and deportations, and threatening the right for workers to organize for safe and healthy workplaces. Despite the challenging times, workers all across the Bay Area have continued to organize and win significant victories against all odds. This year, the minimum wage in San Francisco will increase to $15/hour, a result of the victorious Fight for $15 campaign in 2016. Johannes, long-time CPA member and leader shared, “New immigrant workers often struggle in jobs that have an unstable schedule, no benefits, and discrimination. We know we can do better. Let us continue to build movements that center the most oppressed amongst us and movements broad enough where everyone has a role to play in it. We are stronger together!” Check out the footage of his speech here.